Chinese gold imports jumped 64.5% on an annual basis in Q1 2017, while the production of the yellow metal tumbled 9.3%, as the world’s top gold producer and consumer phased out older production facilities and miners faced lower gold prices, this according to a statement released by the China Gold Association (CGA). The drastic rise in imports was triggered by a supply and demand gap created between January and March of this year, CGA explained on Friday, adding that imports totaled 10.5 metric tons in Q1 as compared to last year’s first quarter. Quarterly output was down at 101.2 metric tons as compared to Q1 2016 figure of 111.6 metric tons, the association said. The reason for the fall in production was attributed to persistently lower gold prices and the increased phase-out of older production facilities, which were triggered by Beijing’s attempts to curb overcapacity, the statement explained. The national gold consumption was up 14.7% on an annual basis at 304 metric tons, CGA said. The breakdown of the figures shows that gold used for bullion production was up 60.2% at 101.19 metric tons and gold for jewelry manufacturing edged up 1.4% to 170.93 metric tons. 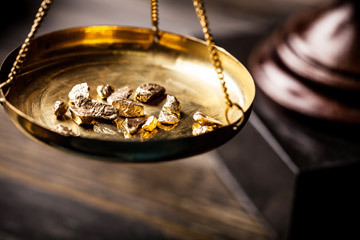 The statement noted increased “public awareness” of buying gold billion as a safe-haven asset during the first quarter, S&P Global Platts cited CGA’s statement as saying. Earlier in April, Reuters reported that China’s net-gold imports via main conduit Hong Kong more than doubled in March on a monthly basis. Net-gold imports rose to 111.647 metric tons during the third month of the year from 47.931 metric tons recorded in February, the news agency quoted data from the Hong Kong Census and Statistics Department.